Book Your Illinois Whitetail Waterfowl Hunt Today! 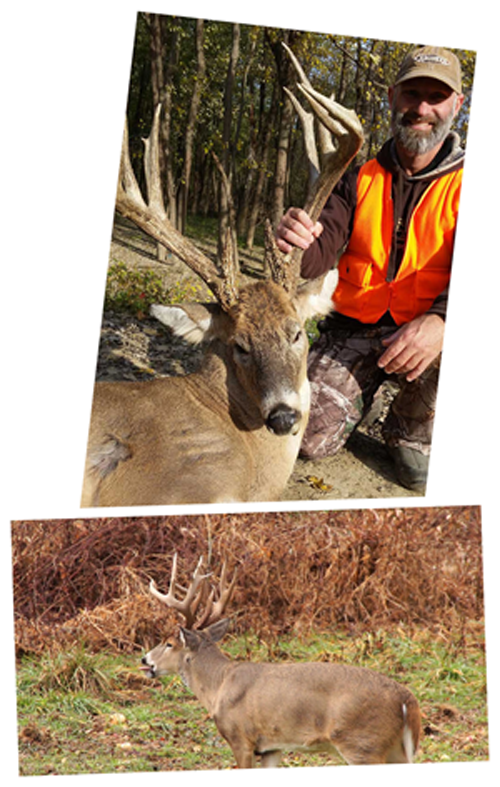 We offer a variety of optimal locations for you to hunt, depending on the time of your hunt. During the early bow season, we focus on water sources and food sources including: acorns, persimmons, row crops, and food plots. Then as late October arrives, the crop fields are harvested and new bucks begin to show up daily as they widen their summer ranges in search of potential early estrus does. During this time, we switch our focus to funnels and pinch points, along with scrape and rub lines. Rattling and calling can be very productive during this stage as well. As the rut approaches, we continue our efforts on pinch points, funnels, and doe feeding areas. Calling and decoying can still be quite effective, so the larger crop fields come into play with the chance to draw a buck into range from a distance. As late November and early December arrive, we change our emphasis to the food sources such as standing corn and beans that are left in the fields. This attracts the deer as they replenish from the rut and provides them with the carbohydrates they need for the cold winter that lies ahead. We also hunt over wheat fields and the other green food plots that we have planted. Our goal is to have the necessary food available that the deer prefer during different weather conditions. Our stands are a mix of lock-on style, ladder, enclosed box, and ground blind stands. However, we always recommend that you bring a stand set of your own to be sure you are comfortable for an all-day sit. We can drop you off at your stand and pick you up, or you can drive to your location yourself, allowing you the freedom to return to the camp as you desire.